People who need (or want) to run Windows or other operating systems on their Intel-powered Macs have three solutions to choose from: VMware Fusion ( ), Sun Microsystems’ VirtualBox, and Parallels Desktop for Mac. 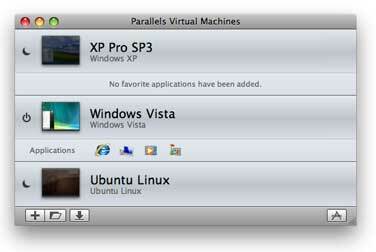 While VirtualBox is the new kid on the block, Parallels is the old-timer, having arrived back in June 2006. Parallels recently released Parallels 4, which promises better performance and Windows/OS X integration than that of its predecessors; the company describes Parallels as the “easy, fast, and powerful way to run Windows on a Mac.” While the product delivers on these promises to some degree, this release of Parallels isn’t without problems. The primary focus of Parallels 4 is increased integration between OS X and Windows’ virtual machines; it achieves this by adding integration features and enabling all those features by default. New features include the ability to boot in Parallels’ Coherence mode, in which the Windows desktop vanishes and XP/Vista’s windows intermingle with those of OS X. You’ll even see Windows’ taskbar notification icons in your OS X menu bar—which can be a problem if you don’t have a lot of space on that bar. Your OS X home folder is also automatically shared with Windows, and a new feature called User Profile Sharing is activated by default. User Profile Sharing mirrors the OS X Desktop, Documents, Pictures, and Music folders with their Windows’ counterparts—so files and folders from one OS are visible and usable in the corresponding folder in the other OS. You’ll also see icons for your running Windows applications in the OS X Dock; and the Open With menus in both Windows and OS X show available programs in both operating systems. While this integration certainly makes working with Windows a seamless experience, it has some downsides, too. The Open With menu for image and text files, for example, can be huge. Also, users might delete a file from Windows’ My Documents folder, for example, without realizing that they’re actually deleting a folder in their OS X Documents folder. Finally, the folder contents are mirrored even when the virtual machine isn’t running—so if you have an alias to Internet Explorer on your Windows desktop, you’ll see that alias on the OS X desktop as well, even if Parallels isn’t running. I experienced a problem with the Profile Sharing feature, too. After initially using it, and downloading a number of apps within the Windows virtual machine, I then disabled Profile Sharing. After logging out of and back into Windows, none of the items I had downloaded appeared on the Windows desktop. Instead, the files were on my OS X desktop; I had to copy them back into the Windows virtual machine and then delete them from OS X. Parallels tech support told me that I could have made them reappear by re-enabling the Shared Profile feature. I didn’t have the chance to test this, however. Because of these flaws, as well as concerns about malware and viruses in Windows affecting files in Mac folders, I prefer to disable the Windows integration features by default. It’s relatively easy to disable them during installation or via the virtual machine’s configuration panels. If you’re setting up a new Windows virtual machine, the Express Windows Installation mode makes things simple. (Unlike VMware’s Fusion, there’s no easy install mode for certain Linux distributions.) If you’re upgrading from Parallels Desktop 3, however, all of your virtual machines must be converted to a new format and then upgraded to work with Parallels 4. Once upgraded, a virtual machine cannot be used with Parallels 3, so it’s a good idea to back up your virtual machine before upgrading—the upgrade dialog box in Parallels 4 makes that simple, telling you how much drive space is required, and creating a backup at the click of a button. Creating a backup is also a good idea, because some users (myself included) have had problems with the upgrade step. In my case, an upgrade to my Windows XP Pro virtual machine seemed to get stuck in a loop, with Windows’ “found new hardware” dialog box appearing over and over for the same hardware. After waiting over six hours for the upgrade to finish, I took a chance and force-restarted the virtual machine. On restart, the upgrade process and the Parallels Tools’ installation completed normally. Other users have not been so lucky—failed upgrades have left some people with unusable virtual machines. Even if you’re unable to back up your entire virtual machine, I recommend that you copy key documents to another location. The latest build of Parallels 4 (3540 as of this writing) addresses some causes of these issues, but posts on Parallels’ forums indicate that some users are still having upgrade issues. In addition to the Coherence (which works only for Windows virtual machines), Window, and Full Screen views, Parallels 4 adds Modality view. Modality scales your virtual machine into a resizable window; the screen is scaled to fit whatever size window you create, while still allowing full interaction with the virtualized OS. This works very well for monitoring virtual machine tasks—you can watch your task while you work on other projects. I found that Modality worked well for both Windows and Linux virtual machines. The Virtual Machine Directory shows the state of all your virtual machines, along with quick-access buttons for launching often-used Windows applications. A welcome addition to Parallels 4 is the Virtual Machine Directory, a window that gives you an overview of your installed virtual machines, a screenshot of each, and (for Windows-based virtual machines) fast access to often-used applications. Removing a virtual machine is more complex than it needs to be—to remove it, you must first open its window, but not launch it. But that’s a minor quibble. Parallels 4 improves on the program’s support for 3-D graphics, offering support for DirectX 9 with Pixel Shader 2, along with OpenGL 2.0 acceleration. (Parallels is the only virtualization app with accelerated OpenGL support). In testing the DirectX support, however, I encountered a couple of issues. While I was running the PassMark benchmark suite in XP Pro and Vista, a 3-D portion of the test showed that Pixel Shader 2.0 support is not present. This same test in VMware’s Fusion showed no such message, and the difference was visible in the quality of the rendered image. Despite improved DirectX support in Parallels 4, this version still comes up short when compared to Fusion 2. In the Fusion 2 image on the left, notice the quality of the sky and the water, and the way the image fades in the distance. By comparison, the Parallels 4 image on the right appears simplistic, and the sky is splotchy. Also, some games that should work with Pixel Shader support, such as the demo for FIFA ‘09, failed to run in Parallels but worked fine in Fusion. Games that worked generally ran fine, although they didn’t seem any faster than they were in Parallels 3. On both my Mac Pro and my MacBook Pro, Fusion generally outpaced Parallels in my DirectX graphics testing. Parallels 4 includes SmartGuard, which allows for automated snapshots; a snapshot is a form of virtual machine backup that doesn’t require huge amounts of drive space. SmartGuard automatically takes a snapshot on some multiple of an hourly basis, and keeps multiple prior snapshots. Parallels saves a mix of hourly, daily, and weekly snapshots, enabling you to easily move back to an older version of your virtual machine. Given that Time Machine doesn’t work well with virtual machines, SmartGuard is a reasonable alternative for effectively backing up your virtual machine. Parallels 4 includes a useful bundle of Windows utilities: Acronis Disk Director for resizing disk partitions; Acronis True Image Home for automated backups, file shredding, and system cleanup; and Parallels Internet Security powered by Kaspersky (12-month subscription) for virus and malware protection. All worked well in my testing, though you’ll only need Disk Director if you have to resize the hard drive in your Windows virtual machine.